To be Elegant, or not to be Elegant? 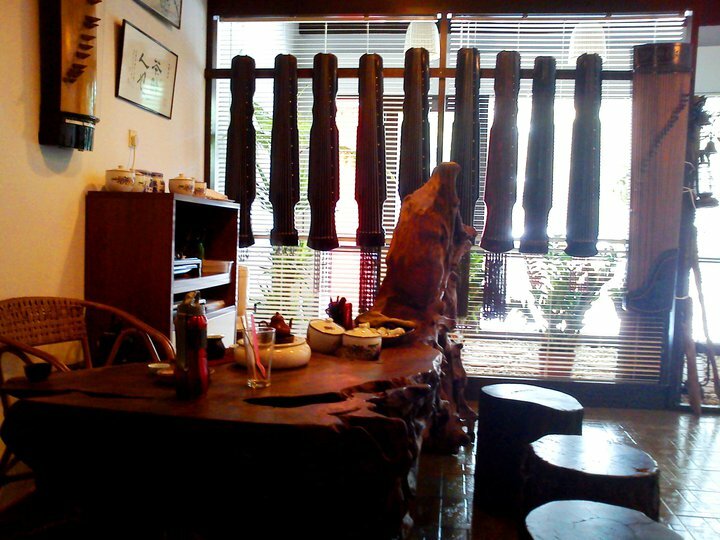 A modern public qin studio lounge, adorned with qins and other instruments used in opera, with a station for ceremoniously preparing tea. The primary trait in filtering Chinese culture to its elite essence is the element of Ya (雅), commonly translated as “elegance”. What does this Ya entail? Let us compare it with its antonym, Su (俗). Where Su is widely accepted and loved by almost everyone, Ya is appreciated by a select few (usually of recluses and the educated); where Su strives to please the senses, Ya has a totally different aim — to “rectify” the senses by transmission of ‘sagely teachings and spirit’ to develop an elevated state of conscious realization of the human condition, coupled with a desire to remove oneself from the delusions of human social deceit. Where Su is artificial and man-made to refinement, Ya is considering the unadorned natural being as refinement and prefection unto itself. 开店开会馆，// Opening a shop, a clubhouse is of choice. 喝茶喝普洱。// And Pu’er is the drink of all teas. Old is new, elegant is the new vulgar? 喝茶喝普洱. // Pu’er is the drink of all teas. 画室当会所. // The art studio is the clubhouse. Numerous netizens have replied and reposted some version of the above statement with commentary on how this is true in not only Beijing, but across all urban centres in China and even beyond. These venues and objects were by and large restrictive and exclusive practices by the wealthy, prestigious, or the educated elite, but with the state and international recognition, commercialization and speculation followed. What was once the greatest expressions of Ya, is now “infested” with the hordes of “vulgar merchants and commoners”, all to willing to open their spending accounts or personal piggy banks for a taste of what was for previous generations something almost mythical in nature. Criticisms of the Heaven Sacrifice in early Feb 2011 in Beijing for resurrecting memories of Manchu tyranny, and relagating them to the epic-scale natural disasters in China, as they both started in 2008. [Quote] According to popular explanation, Chinese cultural traditions are mainly preserved in Taiwan, Hong kong and overseas Chinese communities, and the mainland is where the tradition is at the thinnest. This is to the degree where Singaporean academics suggested that china should “Import Chinese tradition from overseas”, and people like Du Weiming and others wanting to investigate “after the Cultural Revolution, is there any news of re-emerging traditional culture”. Yet the most odd thing was, the first people to bring back out Hanfu originated from the mainland, and the most vocal and active Hanfu Movement also is a mainland movement – not one from the “better preserved” regions of Taiwan, Hong Kong, or overseas. Why is that? As we all know, the Manchu Qing used violent acts to force the Han Chinese to adopt new dress, and its effects were not effectively cleansed during the Republican period. Today, in Hong Kong, Taiwan, and overseas, this set of things [ie. Manchu-style dress] have hijacked the position of “traditional costume”. 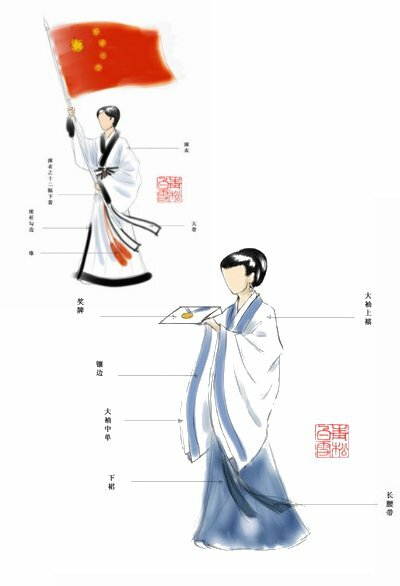 Despite anyone having an interest towards traditional Chinese dress, all he/she can contact is Qipao, Magua, and of the sort (which should be called “counterfeit ethnic costume”). Because the Han Chinese no longer have their traditional dress (to its truest meaning, since they lost even the “counterfeit” stuff like Qipao/Magua), its position in relation with its sibling ethnicities [TL: of the 56-ethnic Zhonghua Minzu] and their flamboyant and unique dress becomes an extremely embarassing one. This has in turn become the impetus for people to find their ethnic dress. Because the “counterfeit ethnic dress” forced by the Manchu Qing also disappeared, it has given us [ie. Hans] a unique opportunity to re-establish a code of ethnic dress. Although in its initial stages, the “counterfeit traditions” lingering in Hong Kong, Taiwan and overseas caused some interference (such as the so-called Tangzhuang as seen in APEC [of 2001]), but since we are no longer living in the Qing, once we have made clear the true forms of Han ethnic clothing, then those “Tangzhuang” and other “counterfeit traditions” will immediately lose their ground, and step back from the stage of history once and for all. Prepared as a speech delivered to a Hanfu enthusiast meeting in Beijing in early October 2009, a Confucian scholar by the net name Qilufeng 齐鲁风 posted this after his debut with revisions, and provides key overview on the current stage of the Hanfu revival movement by differentiating the mainstream views from 2006~2008 with the present day. This essay marks a new stage of maturity in ideological and practical development for the movement, and a convergence and agreement from previous disputes from within the circle, and bears historical significance. The rise of Hanfu was not under a context of a disciplined direction, but rather coupled with the revival of ethnic and tradition awareness, the rebuilding of traditional faiths and many other elements to form a social movement. Hence, from since its founding, it is coupled with issues from the expounding of this line of ideology. The several centuries of decline in Chinese civilization led to Hanfu restorers in their understanding of the object, as well as the thinking behind the actualization of the restoration to be far from the actual Huaxia tradition, and far from reaching the level of our ancestral sages who created ritual and music based on the Way of Heaven, Earth, and Man. Nor would we today have the traditional understanding of these sagely Ways as the Shi literati class would. 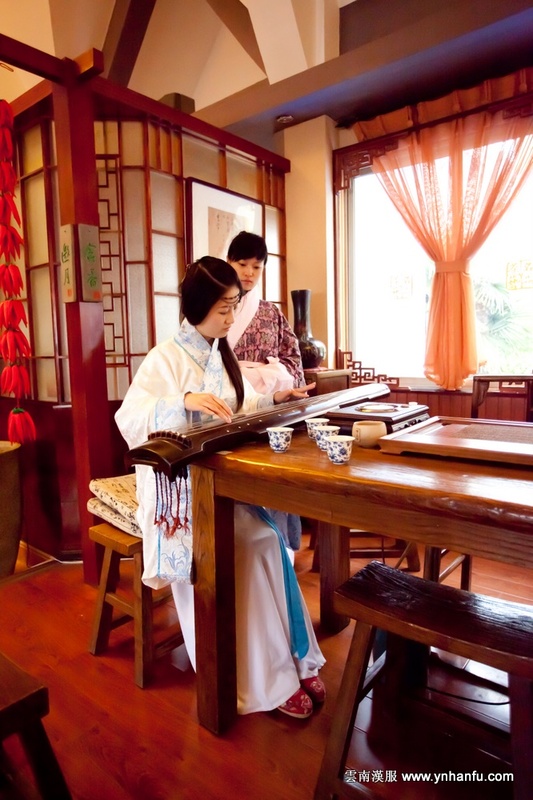 Hanfu inherently does not possess the master-disciple relationship like guqin and many civilian traditional talents and arts. 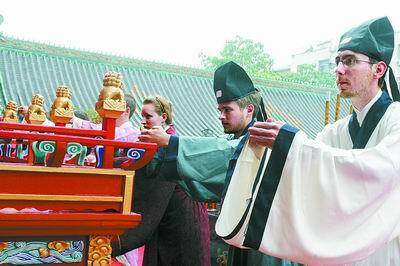 Therefore, early proponents of Hanfu have assumed the role of groundbreakers. Under this situation, the explicating and constructing of ideology for Hanfu in actuality is a process of searching the Way (Dao) to and for the Huaxia tradition. The restoration of Hanfu requires a long period of development, and what it lacks is a supporting system – academic discipline. Ming-standard wedding in Beijing, Oct 4, 2008. Continuing onto some thoughts on conflicts and infighting of some issues in the Hanfu Restoration Movement as part of the Huaxia Renaissance movement, namely onto major ongoing criticisms and unresolved concept standpoints. The purpose of the Hanfu Movement is to ‘restore the impression of Han Chinese clothing (to the Chinese) to the Han Chinese tradition, in response to correcting the mis-impression of tight-formed Qipao and button-up tunics (which we call Tangzhuang today) as representation of all Chinese tradition, which should not be perceived as dead’. It may seem redundant or blindingly obvious to those who are aware , after 3 years of dedicated promotional work. However, the government still does not give any official response to the movement, nor have they responded positively by adopting Hanfu as the representational image of the Han Chinese people, but rather reinforce the Party policy of ethnic diversity, and support ‘traditional’ movements abiding by the Qing standard. While it may sound perfectly fine, the support from the Chinese government to ensure the cultural propriety of the Han Chinese is marginal at best. The year prior to the Olympic Games marked the golden era of actual results in Hanfu awareness promotion. Many shops were getting a significant foothold as sustainable enterprises, and the Hundred Scholars petition made headline news. However, if one look back on the ‘history’ then, as well as today, there are many voices of disagreement within the movement that remain largely unresolved and un-unified. While it will be impossible to list them all, I will try my best to list as many as possible..
Wang Letian, the one who "Started it all"
When speaking of the Hanfu movement, the Internet and Hanminzu.com (then Haanen.net) work hand-in-hand. 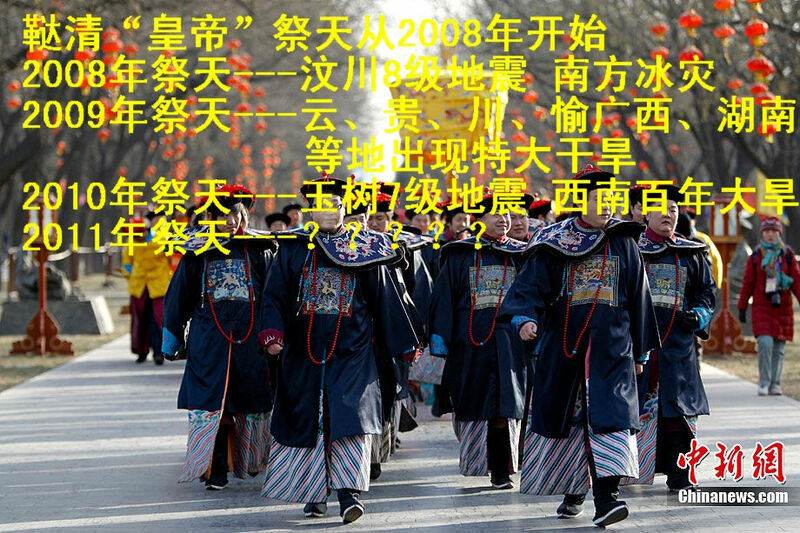 Back in 2002 its few members dedicated to the revival of Han Chinese studies and tradition, some suggested that the then-recent APEC conference (2001) has seriously blundered the Chinese tradition by “putting back on the braids of racial enslavement” in wearing Manchu-inspired clothing. 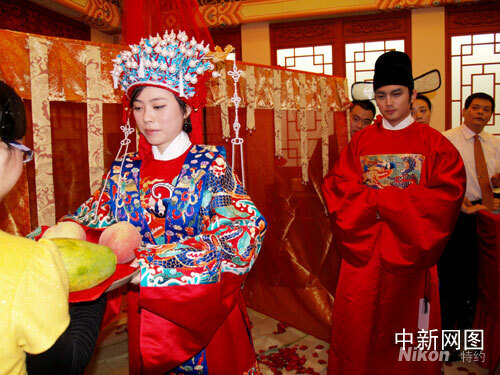 After half a year of discussion, a person by the net name of Zhuangzhi Lingyun (壯志凌雲) decided to do what many only dream of – wear these so-called ancient clothing (古裝) that can only be seen on television dramas, opera stages, and in texts before the Qing. After he got his set of clothes by a tailor in Shanghai, he took it out and wore it for a stroll in his city of Zhengzhou. There was no immediate rave or the world noticing, until Lianhe Zaobao (Singapore) put the picture (left) with caption and a small article that the effect began to spread to Chinese communities throughout the world, gathering people to the site, and eventually beginning gatherings and walks that what we know as the “Hanfu Movement” became an actuality. Beijing New Year’s Guqin Yaji 2005 – Hanfu Movement was on the rise. 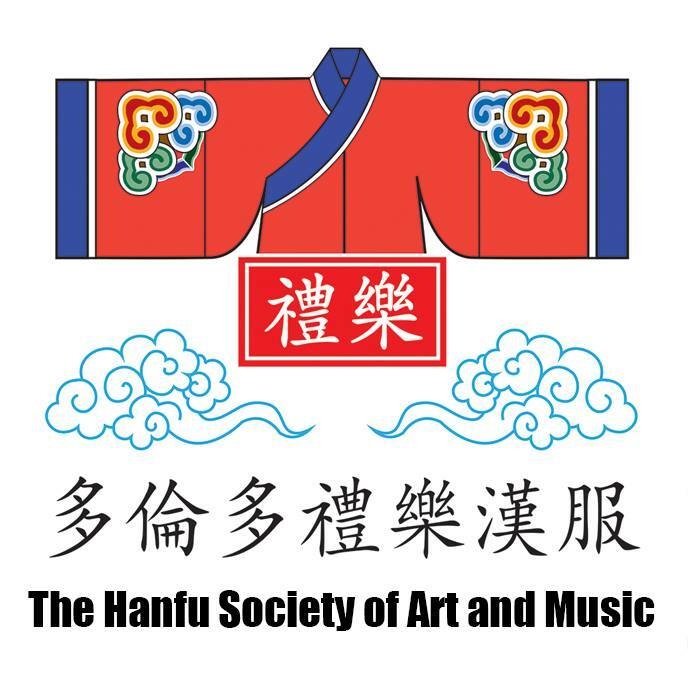 The Hanfu Movement was not without its origins or causes. Tracing back to the 1990’s was a re-focusing of Confucian studies among Chinese scholars, followed by the de facto cause that was the debut of “Tangzhuang” in the 2001 APEC Conference and Wang Letian’s 2003 walk. Ever since 2005, there was a significant commercial move that began to support the Hanfu movement from the market perspective. After all, it is impossible to support a material culture in a market-economy society without making the Thing in question a commodity. Only then, can we have basis for proving the ideas we support by showing material evidence. Let’s take a look at what businesses or attempts have been made over the past 3 years. In response to HanfuTor’s email thread “Koreans are attempting to steal Hanfu”. Thinking back to Fu Lujiang’s proposal for Hanfu as official uniform of the XXIX Olympiad and the resulting Hundred Scholars’ petition, it was in reflection a reactive, unplanned move. Within two months the project was dismissed by the authorities. The actual result was a mix of god-knows-what, primarily from the opinion of the COC and corporate sponsors. While public opinion is always met upon “open ears” (much similar for any UNESCO applications and so forth), the actual results are still slim. Remember that Sun Jiazheng of the Chinese Cultural Department noted explicitly “to let things play out naturally” in response to this proposal just weeks after it being made, and by the next month it was rejected in favor of letting Heng Yuanxiang Corp.’s so-called Tangzhuang take its place. Worst of all, unlike the APEC conference in 2001, nobody will be wearing the ‘new fashions’ of the Olympic games as a new trend or fad or whatever it is, simply because they defy any rational taste for the real world. News of Korean government and advocacy associations about them claiming important festivities and cultural icons – it is not the first day they have started doing so, nor is it the first time (by now) the Chinese have reacted negatively regarding their inventions ‘taken away’ in propriety. While the Chinese netizens’ response are often directed at false news, the fact that the Korean authorities are attempting to get UNESCO to recognize their traditional clothes and herbal medicine is very real, and the proposal details cultures that leans more toward the Chinese standard than ever (by referring to actual Chinese texts, and even media from our Hanfu Movement research), a factor of Korean culture we can see backed up by today’s mass entertainment. The movable-type press as invented by Koreans (prior to Gutenburg) is already in most school textbooks; Duanwu/Tano’o (端午) is still somewhat ambiguous (the Koreans claim that although SIMILAR in name, the nature is different), while herbal lore, writing system, and traditional clothing are the current hot topics and up for grabs. The prize – propriety of the heritage in world history, and means of promoting cultural greatness in the clash of civilizations: a ‘copyright’ to a weapon in the war of culture. What more credit needs to be taken away before the Han Chinese get re-recognized?